I’ve been stamping since 1991. I attended my first stamp show that year and I saw Stampa Barbara–anyone remember that vendor? And I had no idea why there were piles of red dies that many people were interested in! I really enjoy water coloring, however, I have not mastered it. I admire anyone who does water coloring in their stamping designs. I enjoy the primary colors as well as magenta and orchid. My Carl rotary paper cutter. After you have colored and cut out your image, go back over the edges that you cut with a black marker to “hide” the white edges of your cutout item. I am drawn to the designs I see by rubber stamping vendors. I don’t like “cute” designs and I rarely ever see a cute Oriental rubber stamp. VSN always had great articles and I always learned something new. I subscribe to RSM and enjoy seeing the variety of stamping designs and always check out the Stamping Pen Pal ads. If yes, please list. VSM has published three of my cards. Any other hobbies, talent or craft interests? I can knit scarves and crochet baby blankets but I can’t follow written instructions to make other items. When I see cards at shows or in stamp stores. I just retired on May 7! I worked at Levi Strauss & Co. for exactly 40 years. My first day on the job was May 7, 1973. My project is a shadowbox that I have always wanted to do. This size is approximately 6 1/2″ x 6 3/4″ and is by 7gypsies. I left the box white, however, you may paint it any color you wish. The background card stock is red. I stamped the image on white cardstock. I colored her hat, face and hands. I stamped the image once more on Washi paper and cut out the outfit and glued it on the first image. 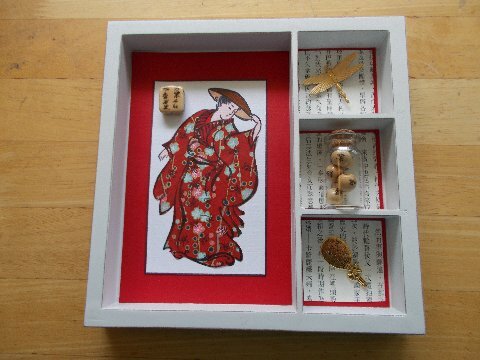 The smaller squares have the red cardstock and I cut out smaller squares of the Oriental character paper. I then glued the dragonfly charm on the top, the tiny bottle is filled with beads with Oriental characters and the bottom square is a fan charm. Very simple. Please give this a try yourself and have fun. Congratulations Yvonne! Well deserved honor!!! LOVE your beautiful shadow box…send profile!!! enjoy your month in the limelight!! congratulations, Yvonne. this is well deserved recognition. Congratulations, Yvonne! You do beautiful work, and I’m reallly excited to see you here as SAM for June. Congratulations! Well deserved – enjoy your month! Really nice project, Yvonne! Congratulations. Congratulations on SAM for the month. Lovely project and great BIO. Well deserving! Your shadow box is beautiful! I love the red! I like how you used the charms. I especially like the bottle of beads! Yvonne, no one deserves to serve as SAM for June than you do. I have many pieces of your art and have always admired your perfection and talent for creating art with an oriental theme. I was so pleased to see your shadow box on the main page. Enjoy your retirement. Gosh!! This is very beautiful!! You put a lot of work in it and it shows! Excellent!! This should be proudly displayed!! Congrats Yvonne for being SAM, The box is awesome and I hope you enjoy your time now that you retired. Congratulations Yvonne. Love your shadow box and enjoyed reading your bio and learning more about you. Enjoy your month. what a fab post and well done on being chosen to be SAM, Yvonne! Just love your work and that shadow box is great idea ~ well done! I like the idea of a deco piece like this! Very nice and clean! Congrats on your feature month! !